Tickets are for ten games, 10 per game in the Kiss and Tell room only. Landing at Bet365 Bingo for the first time you wont find a home page with all flashing banners promoting the welcome bonus. The famous bingo heads from the brand await you with a list of the rooms currently open and details of the games offered. As games start a new room and game are added to the list. Details of the time until next game, room type, game name, ticket prize and jackpot are shown and you have the option to filter the list by game type if you prefer. It's definitely a landing page different from those you may be used to in the world of bingo online. Unfortunately, the main differences between Bet365 Bingo and other brands powered by the Virtue Fusion/Playtech software end here. Register to play with this brand and when you step through their virtual doors you will find the same games available as at many other brands. It takes just moments to register with the site and on completion of the sign up process you have an account login that can be used for all the Bet365 gaming wallets; Sports, In Play, Financials, Casino, Poker and Games as well as Bingo. From the lobby you have several tabs to choose from, all designed to make navigation around the site really quick and easy. It is from here, or the home page that you choose a room most suited to your budget and bingo preferences. The site offers 75, 80 and 90 ball games as well as the themed options, Deal or No Deal Bingo, Lucky Numbers Bingo and The Bingo Games. Step into any of the bingo rooms and you'll find a very familiar layout, the standard Virtue Fusion look for brands using this software. Your chat room is to the left of the screen with instant win games shown above and to the left are you bingo tickets. Above this you will find details of the game prizes and jackpots on offer. 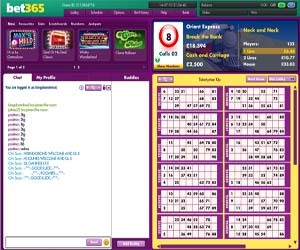 Talking of jackpots, as part of the Virtue Fusion network there are an abundance on offer when you play at Bet365 Bingo; from the daily Bingo Linx games with thousands offered in prize money to the progressive jackpots available in each room. If you are looking to win big, then there are plenty opportunities with this brand. Promotions from this brand are generally the same as with all of those on the network which makes it difficult to put Bet365 Bingo above any of the others available online today. However, it's a well known brand using a trusted software, so there's nothing bad to be sad really. 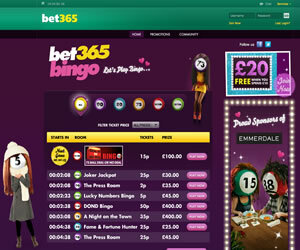 Bet365 Bingo offers three variants of the bingo game at their site however 75 ball is available in different game types. You will find pattetn, multi-part and multi-line 75 ball at this site. Additionally there are 80 and 90 ball games offered as well as themed games like Deal or No Deal Bingo, Lucky Numbers Bingo and The Bingo Games. The brand also offer a wide variety of instant win casino style games. Minimum deposit is actually £5 as standard. 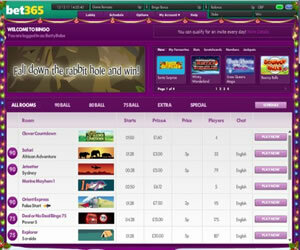 Wagering requirements at Bet365 Bingo are 4x the amount of deposit.